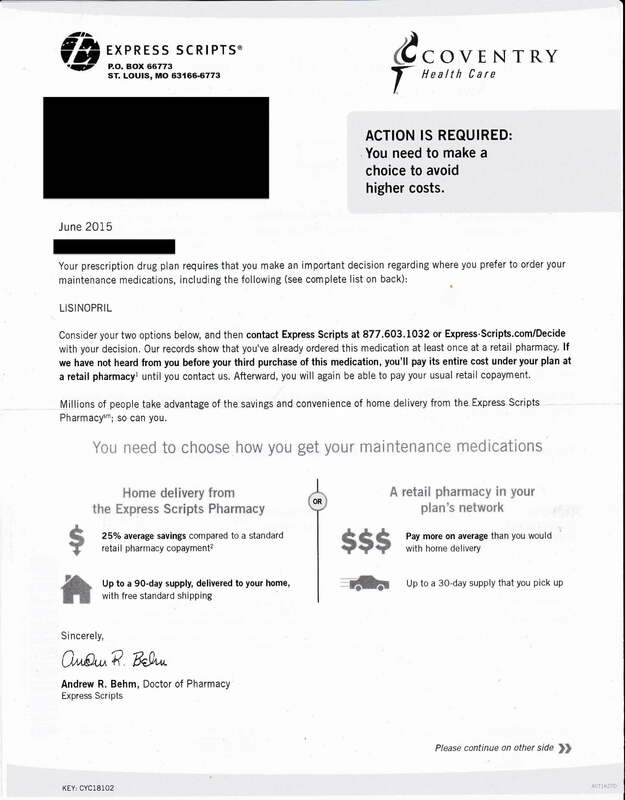 I recently received a letter from Express Scripts which is a company I had never heard of before I received the letter. I receive so much garbage in the mail every day that I usually just give it a quick glance before it goes to the trash, but something in this letter caught my eye. They knew the name of a blood pressure medication I was taking which is called Lisinopril, so I read it a bit more carefully. I was curious who these people were and how they had this private information about me. Full Disclosure: I hate all insurance companies. Life, health, home, auto, you name it. I think insurance companies are parasites on both people and the economy. Don’t get me wrong, I understand how useful they can be when you need them, but they always seem to find some technicality to try and deny your claims or if they can’t deny they love to raise your rates or just cancel your policy. The insurance industry as a whole make obscene profits and have among the highest paid executives in the country. They seem to do their best to make you feel guilty about ever filing a claim and punish you with rate hikes or cancellations to discourage claims. We desperately need insurance reform and better regulations to keep these blood suckers in line. Policies are so long and complicated the average consumer has no idea what is even covered under their policies and inevitably there is some fine print they can use to deny almost any claim. My sister had been paying for full home owners coverage for decades and had not filed one claim in all those years. One year there was a really bad storm and a tree fell and damaged the roof. A few months later they had a trailer stolen from their yard. The insurance agent warned them if they filed one more claim in the next three years their homeowners would be cancelled and their rates were also raised even though for decades they had never filed a single claim. After paying tens of thousands of dollars over the years which was far more than those two recent claims, they received a rate hike and a threat of cancellation if they filed another claim. I am sure all of you have your own horror stories. I think it was Groucho Marx who said the insurance racket is like renting someone an umbrella, and then taking it away when it rains. Insurance companies have one goal, to make money. They’ll help you out, but like a loan shark, they’ll make you pay through the nose for that help. Right out of college I worked as a car claims adjuster for a large company. A supervisor told me our goal was to deny, deny, deny and if they persisted on the fourth try to start the claim process. I hated that job and quit after only a few months because it just felt dirty and was also monotonous. I couldn’t imagine spending decades working for an industry I despised. I fully understand the need for often unscrupulous ambulance chasing lawyers that advertise their services with rap music playing and other absurdities who are just as bad. But to fight evil sometimes you have to recruit your own bad guy to fight fire with fire. Sorry for the rant but I did want to make my bias against insurance companies to be clearly known. The letter I received from Express Scripts had this one line which infuriated me and was the impetus for this article. In other words, if you don’t call us by the phone and listen to our sales pitch to try to use our services we will no longer pay for your prescriptions from your local pharmacy which is my case is Kroger. I carefully looked over my health insurance policy and could find no mention of needing to call and listen to a sales pitch about using a mail-in order service as a condition of having my medication covered. This almost reminds me of those time-share tactics. They offer you a “free” trip to resorts but then force you to sit through hours of sales pitches and videos to get your “free” trip. If you refuse, they will charge you an exorbitantly high fee for your room. But in this case I have to call to listen to a sales pitch to keep getting my medication covered. Does that outrage anyone else? Here is what I discovered about this company called Express Scripts.They have 30,000 employees and had $93.9 billion in revenue. They operate under subsidiaries known as Express Scripts Canada, Freedom Fertility Pharmacy, Accredo, and United BioSource Corporation. Their websites includes Express-Scripts.com, DrugDigest.org, and Lab.Express-Scripts.com They operate under the stock symbol ESRX and although I won’t be using their services as a customer, I will likely add them to my stock portfolio since they seem to be doing extremely well. Take a look at their five year chart. More corporate information can be found here about this company. This is how they seem to make their money. Founded in 1986, Express Scripts aligns its interests with those of clients and patients. Alignment of interests means that we make money when our clients and patients save money — when patients use more generics, choose lower-cost brand drugs and take advantage of our cost-effective Home Delivery services. Our legacy of independence means that our programs and original research benefit our clients. Essentially they do their best to switch all patients to generic versions of medicines or switch to lower cost alternatives to save insurance companies money. I don’t know about you, but I am enraged that my health insurance company gave my private information to this third-party pharmacy and then threaten to charge me more if I don’t switch to them. Can you imagine how many elderly or other more vulnerable people get snookered into signing up or even worse have to pay higher prices for medicine because they didn’t call to sign up or refuse? No wonder their profits are soaring. There are good reasons to prefer a local pharmacy where you can speak to a pharmacist face to face at times to ask questions. This type of strong-arm tactics worries and angers me a great deal. Everyone likes to save money, but I am guessing the ones benefitting the most aren’t the consumers. Hi, Alan. You might be interested in reading this article: https://www.linkedin.com/pulse/untold-truthhow-your-pharmacy-benefits-manager-pbm-makes-squires. 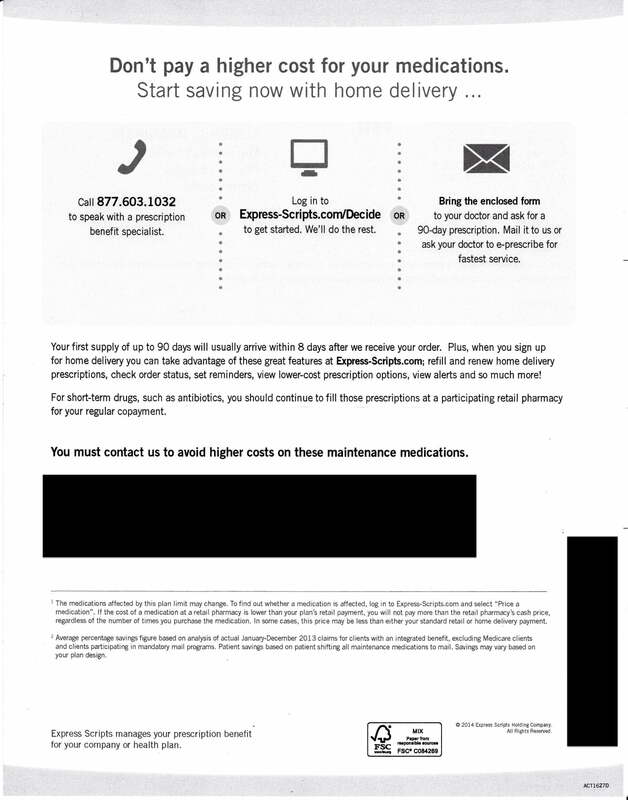 Express Scripts calls and emails regularly to inform me that I am paying more for 2 prescriptions that I fill at Walmart than I would be if I used their mail-order service. The difference for me is insignificant (about $12/year), but they are paying someone to call and try to convince me to switch. I don’t know fully comprehend everything that Mr. Squires explains in the article, but clearly PBMs manipulate at nearly every level of the process so that cost savings are unscrupulously hidden from their clients.